Each month Mile High Sports Magazine sits down with an important figure in Colorado sports. 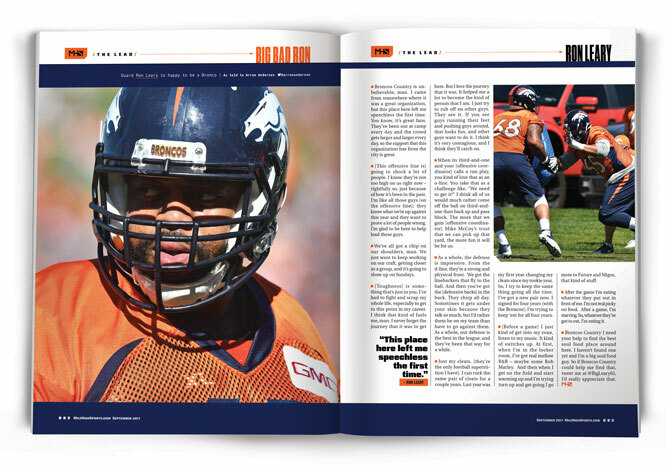 For September, Arran Andersen spoke with new Broncos offensive lineman Ron Leary. 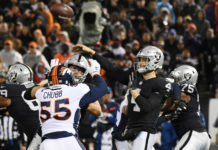 Here’s the best of what Leary had to say about coming to Denver, his expectations for the revamped offensive line, and he puts out a special request to Broncos Country. 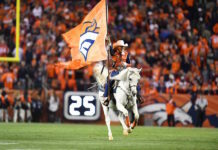 Ron Leary: Broncos Country is unbelievable, man. I came from somewhere where it was a great organization, but this place here left me speechless the first time. You know, it’s great fans. They’ve been out at camp every day and the crowd gets larger and larger every day, so the support that this organization has from the city is great. [This offensive line is] going to shock a lot of people. I know they’re not too high on us right now – rightfully so, just because of how it’s been in the past. But like all those guys [on the offensive line], they know what we’re up against this year and they want to prove a lot of people wrong. I’m glad to be here to help lead these guys. We’ve all got a chip on our shoulders, man. We just want to keep working on our craft, getting closer as a group, and it’s going to show up on Sundays. [Toughness] is something that’s just in you. I’ve had to fight and scrap my whole life, especially to get to this point in my career. I think that kind of fuels me, man. I never forget the journey that it was to get here. But I love the journey that it was. It helped me a lot to become the kind of person that I am. I just try to rub off on other guys. They see it. If you see guys running their feet and pushing guys around, that looks fun, and other guys want to do it. I think it’s very contagious, and I think they’ll catch on. When its third-and-one and your [offensive coordinator] calls a run play, you kind of love that as an O-Line. You take that as a challenge like, “We need to get it!” I think all of us would much rather come off the ball on third-and-one than back up and pass block. The more that we gain [offensive coordinator] Mike McCoy’s trust that we can pick up that yard, the more fun it will be for us. As a whole, the defense is impressive. From the D-Line, they’re a strong and physical front. We got the linebackers that fly to the ball. And then you’ve got the [defensive backs] in the back. They chirp all day. Sometimes it gets under your skin because they talk so much, but I’d rather them be on my team than have to go against them. As a whole, our defense is the best in the league, and they’ve been that way for a while. Just my cleats, [they’re the only football superstition I have]. I can rock the same pair of cleats for a couple years. Last year was my first year changing my cleats since my rookie year. So, I try to keep the same thing going all the time. I’ve got a new pair now. I signed for four years [with the Broncos]; I’m trying to keep ‘em for all four years. [Before a game] I just kind of get into my zone, listen to my music. It kind of switches up. At first, when I’m in the locker room, I’ve got real mellow R&B – maybe some Bob Marley. And then when I get on the field and start warming up and I’m trying turn up and get going, I go more to Future and Migos, that kind of stuff. After the game I’m eating whatever they put out in front of me. I’m not real picky on food. After a game, I’m starving so whatever they’ve got to eat, I’m eating it. 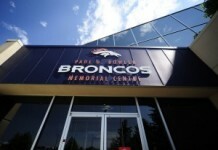 Broncos Country I need your help to find the best Soul Food place around here. I haven’t found one yet and I’m a big Soul Food guy. So if Broncos Country could help me find that tweet me at @BigLeary65, I’d really appreciate that.